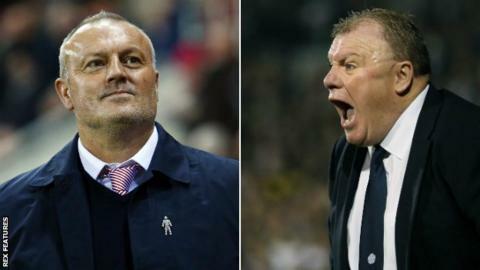 Leeds head coach Steve Evans has said Rotherham boss Neil Redfearn "sounds like a man under extreme pressure" after Redfearn suggested Evans signed "substandard" players in the summer. Redfearn took over from Evans at the New York Stadium in October. The Millers lost 2-0 to Huddersfield on Tuesday and are four points adrift of safety in the Championship. "We let good players go and replaced them with players who are substandard," Redfearn told BBC Radio Sheffield. "This squad of players is not good enough for this level. We probably didn't recruit well in the summer. "This isn't going to go away. We have got to get better players in, players who know this level and can compete at this level." Rotherham, who finished 21st in the Championship last season, have lost 14 of their 21 games so far this campaign and conceded 38 goals - the most in the league. Evans, who took over at Elland Road in November after Redfearn's successor Uwe Rosler was sacked, led Rotherham to back-to-back promotions to the second tier. He thinks Redfearn is worried about losing his job after winning just two of his first 11 matches. "I could have said that here couldn't I? But I have got too much professionalism about myself," Evans said. Rotherham visit Leeds in the FA Cup third round on Saturday, 9 January.